Does a dog wash and grooming franchise appeal to you? You adore animals and most of all dogs. Taking care of our four-footed friends is a delight. They enjoy being with you too, being pampered so lovingly. You nod with determination, knowing full well that you have it in you to turn this pleasurable pastime into a career. Nothing needs to keep you from finding a dependable dog wash business for sale in Melbourne. However, which one to choose? A cursory search on the internet will deliver a few dozen company names. Among them, you’ll find Aussie Pooch Mobile Dog Wash. Perhaps we’re ranking first, or maybe you found us only barely in the top ten. After all, different search engines yield different results, but how much does that ranking truly matter? Why should you have faith in us, when so many other companies vie for your attention and promise you the world? Would you rather we painted you an overly rosy picture or do you prefer to see realistic perspectives? The awful truth about promises made on the internet, or anywhere else for that matter, is that they’re easy to make. If an offer sounds too good to be true, then that’s probably indeed the case. Avoid any dog grooming business for sale in Melbourne which leaves you with the impression that caring for dogs is as easy as stealing a Yummy Doggy treat from a puppy. It’s tough work! No, you won’t be exhausted every evening, but you’ll be putting much energy into your work nonetheless. Consider this energy an investment, however. Together with a positive attitude, it will pay off. Also, don’t trust any dog grooming franchise in Melbourne who’ll guarantee you easy money. No, you won’t become a millionaire overnight. Yes, you will require a starting capital. How much? That depends on many factors. Filling out our enquiry form won’t cost you anything at all though, and we highly recommend you do so if you are truly serious about becoming a dog washer and groomer. It’s a great job, with no experience required, but with a positive attitude, honest self-motivation and a healthy supply of enthusiasm. 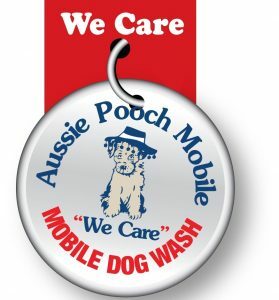 What do Aussie Pooch Mobile Dog Wash & Grooming have that other companies don’t? Compare the trustworthy companies you’ve found on the internet, and you’ll see that most offer the same. If you’re an adept with spreadsheets, you can put all the pros and cons in columns next to each other to see the result at a glance. However, allow us to take that chore off your shoulders. There will be a few differences, but there’s one which makes Aussie Pooch Mobile Dog Wash & Grooming stand out. We started in 1990 with a single mobile dog wash unit. That’s nearly thirty years ago. Experience this vast is hard to find and should count for something, shouldn’t it? We count highly-dedicated people among our franchisees, who make us proud. 200 operators worldwide is another factor which other companies cannot always boast. Last but not least, we care. Those aren’t just hollow, meaningless words for us. They’re our philosophy, and we feel confident that you’ll want to make it your motto too.